what a great idea. nice work. The very concept is pretty interesting. But the way you based them adds extra points, it’s evocative, like some kind of Labyrinth (the movie) but twisted and darker. I really, really like it a lot!! Damn those shardwrack spines look very cool. Don’t want fall off those platforms. 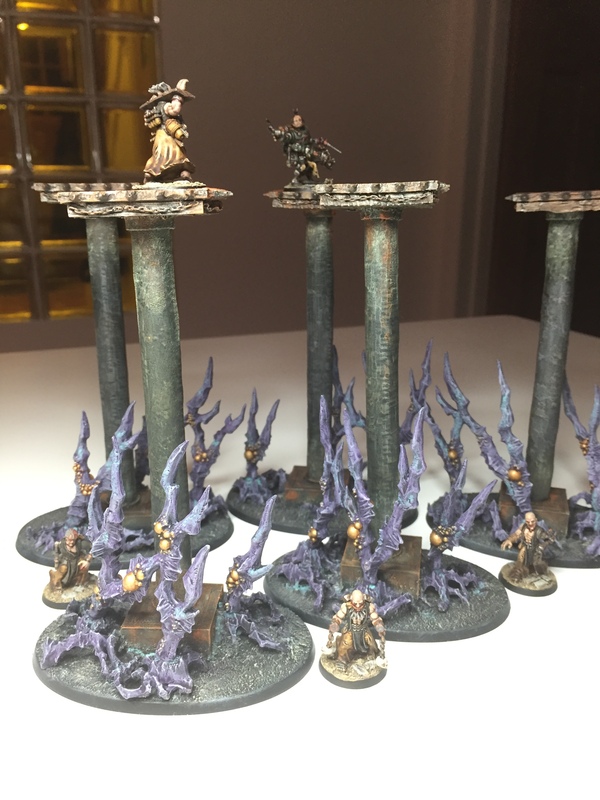 Love the purple on the spines – I really need to branch out into some xenoflora terrain as I have way too many grey ruins at the moment. New words new words! Stylites? Shardwracks? They do indeed look good and I must compliment you on the execution- especially the oxide. Methinks you are speaking GW? Probably? It always cracks me up the terms they use, but if I’m off base let me know? I can definitely see how these would be fun in a game. And the purple is cool! 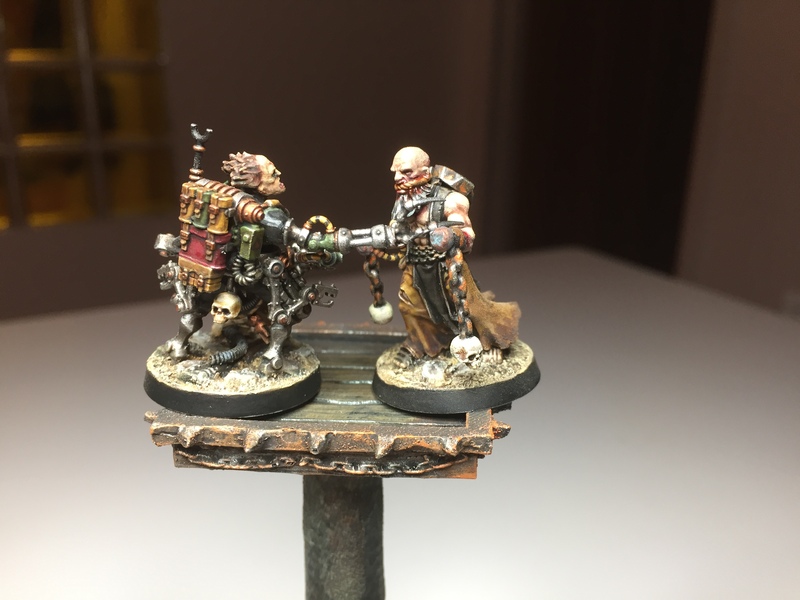 Thanks Mark – ‘Shardwrack’ is indeed a GW thing, and part of their Deathworld terrain offering… Not bad for what it is, and useful for tortured landscapes & general weirdness. Makes sense and I always like to grow my vocabulary. Add stylites! The GW stuff can be a bit annoying on the paint front, but I still buy them. Much prefer yours over the box colours. Despite my venture into yellows and oranges of late I’ll always be a muted, toned down and grim painter hehe. You’ve done really well with them. I’d like to see some skellies and or decaying bodies too though hehe. Cheers mate, yeah, the box colours were a bit much imo. 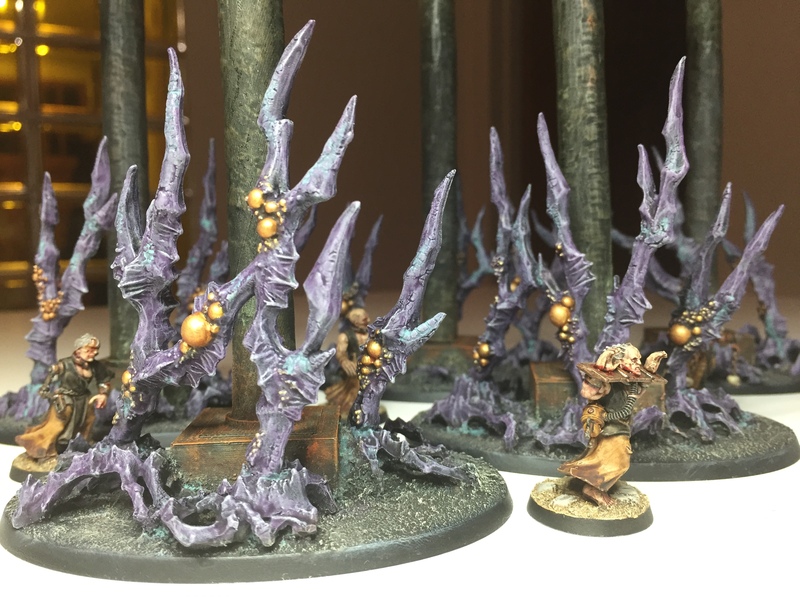 I definitely could do with some bones & ting around the base, and I also fancy some hanging chains and other oddities, but they’ll have to be follow-up items I’m afraid – I was against the clock! Cool man. Even a pentinence clawing his way back up a stylite would be ace! They are looking very cool mate and the spines give them an even more dangerous aspect. 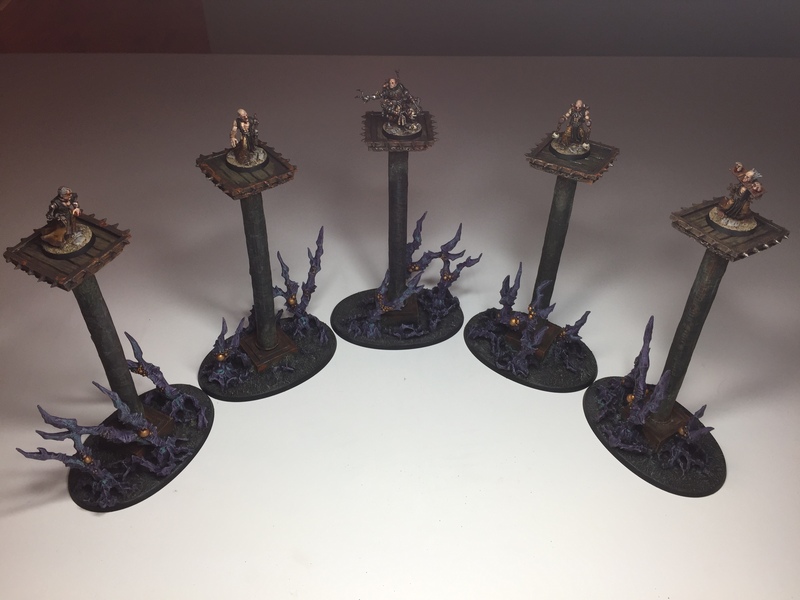 Can you still take the stylites off the base, or have you glued them in? 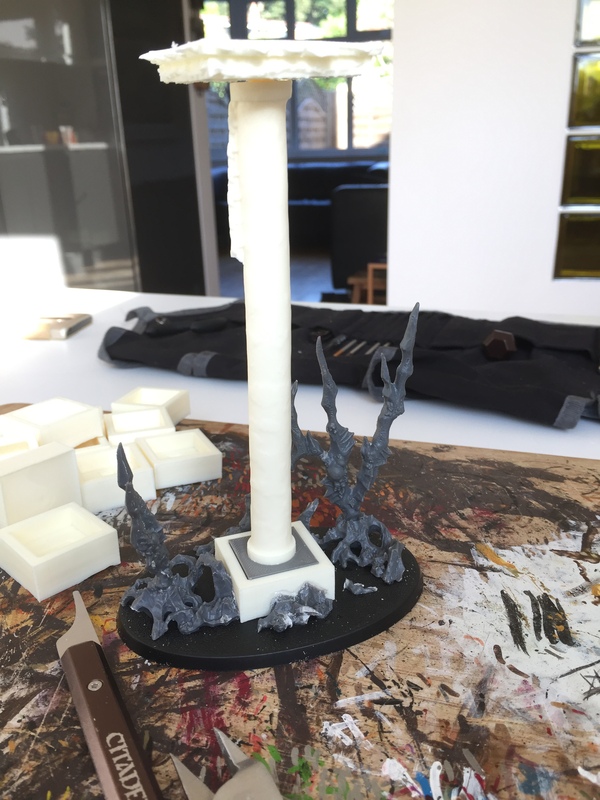 I have glued the stylites together in terms of the platform, pillar and square connecting plate, but the connecting plate isn’t glued into the main base, so it can be removed safely. Nice! :) Love the colors you went with. You definely have the flexibility there mate. Those would look good in several environments. Ace painting dude. 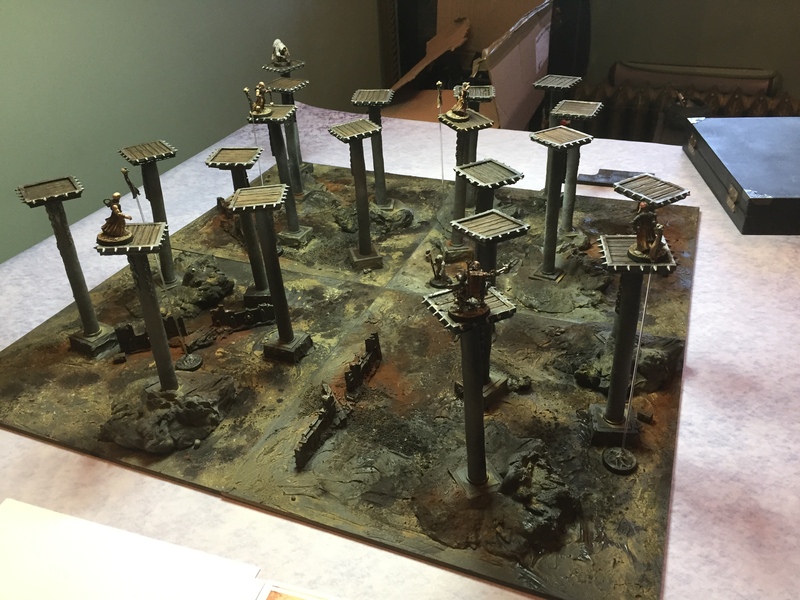 What’s Frostgrave like as a game? Very nice work here. 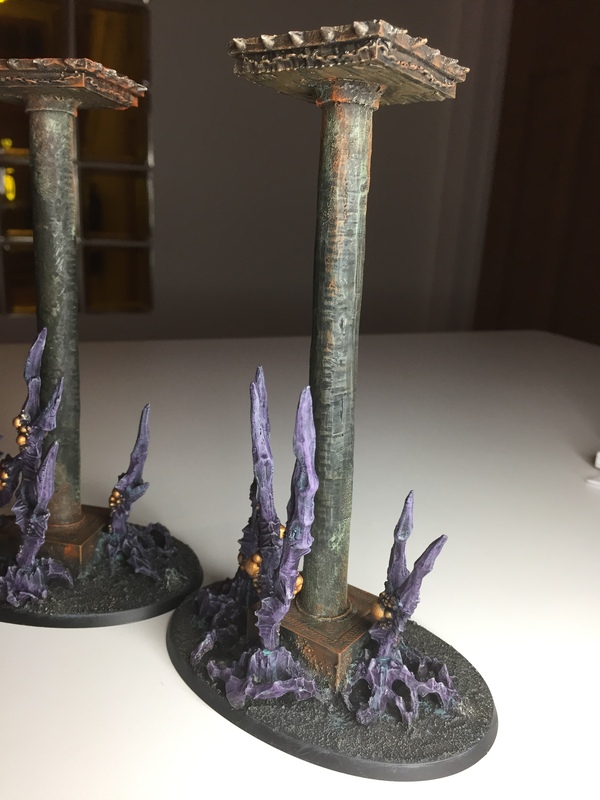 The addition of the Spines to their bases really enhances the look of the pillars.